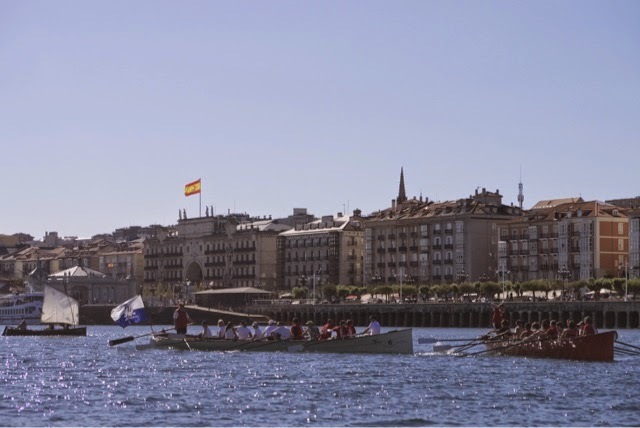 For journalistic reasons I get press releases about property round the world which I usually glance at and delete in one fluid operation, but today I got one about the northern Spanish region of Cantabria, and the words "fierce local rowing competitions" just leapt off the page. A quick Google and I discovered a rather wonderful boat called the trainera (pronounced try-nera), the traditional rowing boat of the Basque country. The trainera gets its name from closely-woven nets called traina, used to catch anchovies and sardines. the working traineras of yesteryear were broader for greater carrying capacity and could also be sailed, but they were raced from at least 1859 when the first recorded regatta was held at Santander. The introduction of the infernal combustion engine made traineras obsolete for fishing but racing continued, the boats evolving into a much slenderer shape for speed. New ones are high tech indeed, using carbon fibre and kevlar, but they still use a traditional single thole pin with the oar attached by a loop of rope called an estribo (known in Catalonia as an estrop and in Scotland as a humliband. I love these words). The hulls are 12m long and carry a crew of 12 rowers in pairs plus a bowman (callled a proel) and cox (called the patron). The stern is an interesting canoe shape. Apparently, turning the boat any sort of a sea is a very tricky operation, which I imagine may be because the stern would slice through an incoming wave and risk swamping the boat whereas the little transom on a Cornish pilot gig would lift the stern out of the water. Mind you, turning a gig away from the wind is not a risk-free operation either. Another joy was discovering Pamela Cahill's lovely blog, from which I ruthlessly stole these pictures. An Irishwoman living in Santander, Pamela's club sounds like fun. She writes: "When it’s warm outside we go over to the Puntal sandbank and park up to have a swim. When it’s cold – it’s a hot coffee before we go – a fast row with our fleeces on – and a coffee again to warm up on dry land. The destination is determined by the wind and the weather rather than anything else. Some days we are adventurous and pack a picnic and head off for a few miles up river to the Rio Cubas. (When I say picnic, you should read banquet fit for a king.)" Sounds just like Langstone Cutters. Who, incidentally, are rowing out for a Full English at the Marina Bar tomorrow first thing. 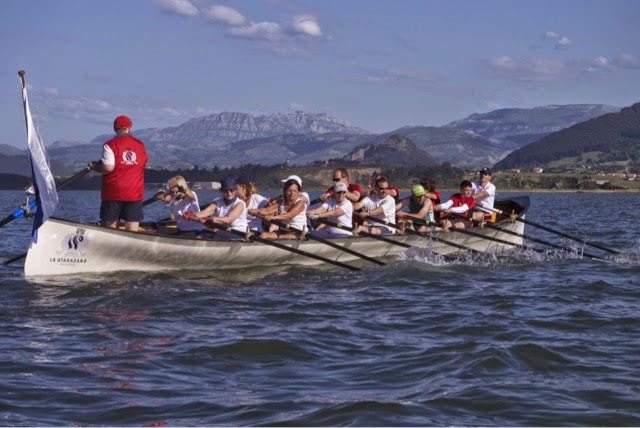 Pamela's blog is at http://pamelacahill.com/2014/06/21/trainera-rowing-santander-bay/. Scroll down for lots more pictures of traineras, and other local boats. Not sure about the reference about Pilot Gigs turning away from the wind not being risk free ? Could you perhaps be talking about being under sail. I've rowed in some pretty horrendous conditions without any real worry. The only potential disaster really is going beam on in breaking surf. Not recommended in any boat I should have thought ? I think it depends on your definition of 'horrendous'. Pilot gigs are amazingly seaworthy and capable of taking much more punishment than most crews, but I have always had a slight feeling of unease at that moment when the waves are coming in over the stern quarter. I still think the gig's transom is better than the trainera's canoe stern. Agreed, both the bow profile and transom on a CPG are designed to "lift" the boat over a wave, or be lifted by a following sea, rather than punching through them. Horrendous conditions ? A subjective assessment I guess, but most gig rowers would commonly row in conditions which few other rowers would dream of going out in. Generally speaking, if it's possible to launch and recover the boat then rowing is seldom cancelled, and you're right, they are amazingly seaworthy. The conditions in which they develloped and a long history of having to be fit for purpose, have all ensured this. Plymouth Sound to the Eddistone Lighthouse, and back, in a force five, circumnavigating Ramsey Island (anybody familiar with Ramsey will know what this can entail), many rows in waves large enough prevent a constant view of the other boats in a race... etc etc. I can honestly say I've never felt vaulnerable in a gig, except when the cox wasn't up to much. In fact their seaworthyness is possibly their biggest problem, in that they are too easy to row badly. I must admit I'm a bit of a wuss when it comes to going out in F5s, but that is partly because I mainly row Solent galleys which are delicate racing machines with restricted freeboard, definitely not designed to cope with big seas. However, a Falmouth guy told me there has been an alarming increase in the number of pilot gigs capsizing recently - about one a year. Probably the result of launching in a nice sheltered estuary and finding it is a lot worse than expected when they get out in the open. I think that's a huge exageration to be honest, and I think it's mostly due to poor coxing. In fact some friends of mine suffered one of the capsizes a few years ago. An inexperienced cox, and a "freak" wave breaking beam on resulted in the gig being washed up onto a rock shelf, from where it rolled back into the sea. I can't comment further as I wasn't there, but I do know this club routinely goes out in diffacult conditions and are well used to making a sensible assessment of the risks. One simply can't accout for every possible situation. One thing is for certain, far fewer gig capsizes occur than fine boats in any given year. It is an issue that has become rather more publicly discussed after the capsize of a gig during the county championships at Newquay recently. Rounding a buoy in rough conditions, the following boat got too close and it's bow was lifted up onto the transom of the leading gig by a wave. When the wave passed the following boat just rolled off the lead gig's transom and capsized. Poor coxing to my mind, and nothing to do with the design of the boats. If you care to google "gig capsize Newquay rowing championships" you can acctually see the incident for yourself if you like, as it was filmed by somebody on one of the spectator boats. Any oudoor sport is by definition subject to a certain amount of unavoidable risk, and frankly managing it is one of the attractions of gig rowing, for me at least.It's just a case of not being stupid about it. I have to say that I'm an avid follower of the university boat race, but it does make me giggle when the pundits start to predict certain disaster as a result of what can only be described as large ripples on the course. I also recall a recent world championship regatta where James Cracknel made a bit of a fool of himself complaining constantly about the cross winds and stating that all the best crews were being outrageously disadvantaged by their racing positions. The real laugh was that in not a single race did the supposedly anfairly advantaged boat win. I'm possibly digressing a bit here but basicly I love all types of rowing and find it endlessly fascinating to try as many types as possible. I must say that I do enjoy your blog and am nothing but envious of where you get to row and the Langstone Cutters club. You do seem to have the balance pretty well right.